On Monday, Salesforce CEO Marc Benioff admonished San Francisco business leaders who are unwilling to give to aid the city’s homeless. Just last week, Benioff sparred on social media with Twitter CEO Jack Dorsey over Proposition C, a measure to be voted on in the upcoming San Francisco election that would raise a certain tax on large companies to help the city deal with its homelessness problem. “You’re either for the homeless and for the kids and for the hospitals, or you’re for yourself. You can decide who you’re for, and it’s really that simple,” Benioff said. On Monday, Salesforce CEO Marc Benioff had sharp words for San Francisco CEOs who aren’t helping with the city’s homelessness problem, just days after a heated exchange of tweets with Twitter CEO Jack Dorsey. “I know if we’re going to raise money for our schools, our hospitals, our homeless, our NGOs, there is a group of people in the city who are willing to give, and there is a group of people in the city who give nothing,” Benioff said on stage at the Wired 25 conference, answering a question from interviewer Adam Rogers of Wired about his dissent from Dorsey. 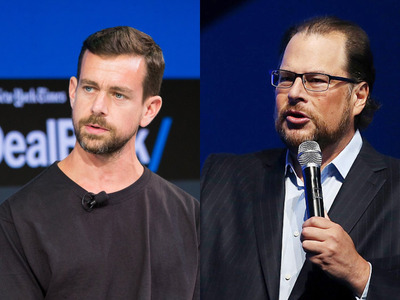 Benioff and Dorsey got into this Twitter spat last week over Proposition C, a measure on the upcoming San Francisco city ballot that would raise a certain tax on large companies to aid the city in tackling its growing homelessness problem. The two San Francisco tech giants debated the measure, with Benioff challenging Dorsey to list his charitable giving in the city, though they later spoke on the phone to patch things up, Dorsey tweeted. When Rogers said at the conference that he loved the idea of taxing billionaires, Benioff agreed. Benioff has a net worth of $US6.1 billion, according to Forbes. Benioff said at the Wired 25 conference that he had spoken to “every high net worth individual in the city,” and he knows who’s willing to give money and who isn’t. “I already have the lists,” he said. Not long after Benioff left the stage, Dorsey took his own turn in the spotlight at Wired 25. However, Dorsey wasn’t asked about Proposition C or Benioff’s comments, nor did he offer his own thoughts. Below is the tweet that started it all.